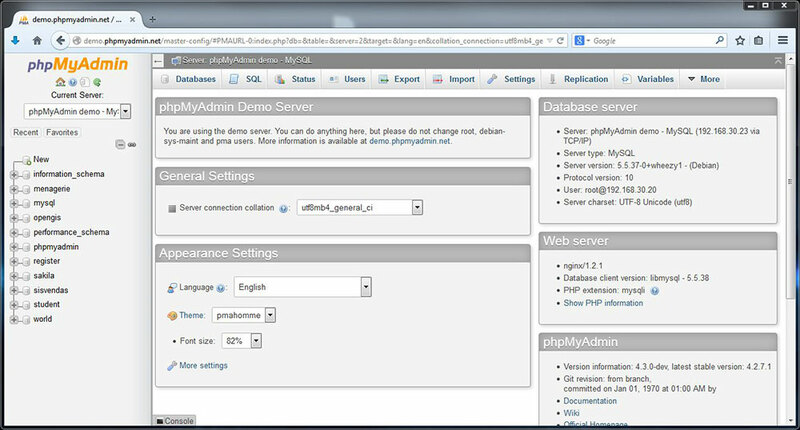 "phpMyAdmin is a free tool to handle the administration of MySQL over the Internet." phpMyAdmin is a free software tool written in PHP, which handled the administration and management of MySQL over the Internet through your Internet browser. It supposed a wide range of operations on MySQL, MariaDB, and Drizzle. You can manage operations such as databases, tables, columns, indexes, relations, permissions, and users. These can all be managed through the user interface that you can reach through your local server through your Internet browser. With phpMyAdmin, you have the ability to directly execute any SQL statement, and do all general maintenance and management tasks through your web browser to make it easier for you to manage your SQL server without having to go through the terminal. Many people prefer to have all of there options right in front of them rather than entering all of the information manually. This is very deeply documented and you can find a lot of information on how to manage things easier using phpMyAdmin through tutorials or basic documentation by the developers or other experienced users over the Internet. There are many wikis and tutorials online for you to look over which will make your experience with phpMyAdmin and even easier one. Having won several awards, it was chosen as the best PHP application in various awards and has won the SourceForce.net Community choice Award as "Best Tool or Utility for SysAdmins" for every year since it's start. With a large, dedicated community backing it, are experienced with using it, and have been using it for many years, phpMyAdmin continues to be the most popular SysAdmin utility freely available on the Internet for novices and experts.